On Friday, November 30, 2012, from 6:00 pm to 8:30 pm, lifestyle guru Matthew Mead will be at our inn for an evening of sharing holiday ideas and Christmas cheer. Guests will meet Matthew and received a signed copy of his newest "bookazine" Matthew Mead Holiday, a lovely ornament for your tree, and Matthew will guide you in creating a mini terrarium in a reproduction jelly jar. Attendees will also enjoy wonderful desserts and beverages provided by the Spotted Cod. This holiday event is being conducted by the Spotted Cod gift shop that is located in the heart of historic Sandwich Village. 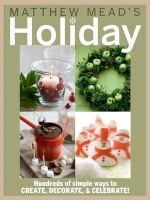 Holiday inspirations from this lovely store are featured in the 2012 Matthew Mead Holiday magazine. Matthew is a nationally known lifestyle and entertaining expert whose magazine is sold throughout the United States. He has been a contributor to many publications that are household names including Better Homes and Gardens, Country Living, and Victoria magazines. He is a frequent contributor to HGTV and the Discovery Channel. Mr. Mead is known for his use of vintage treasures to design beautiful spaces for the home. He has authored books featuring decorating and lifestyle ideas for each season of the year and for Halloween and Christmas. Each of these beautiful books includes fabulous recipes that will inspire you to create beautiful food for entertaining family and friends. You will also find ideas for re-purposing your own treasures to create beautiful spaces in your home. I think of him as the man for all seasons. This is just one of many events throughout the weekend that will certainly put you in the holiday spirit. On Saturday, December 1st, from 10:00 am until 2:00 pm, Mr. Mead will be at the Spotted Cod for a book signing. If you can't make the Friday evening event, be sure to stop by on Saturday and pick up a copy of his beautiful holiday magazine and get a head start on your shopping for those on your holiday gift list. For more information, and to make reservations for the Friday evening event, call the Spotted Cod at 508-888-8263. Be sure to visit Matthew Mead's website to learn about the things that inspire him and to meet the members of his team. Web Site Design, Hosting and Promotion by Acorn Internet Services, Inc.